Through LITE, data and reports are accessed from a single Enterprise Data Warehouse where accuracy and consistency is assured. The Leading Insight Through Empowerment (LITE) initiative began in April of 2017 with the goal of providing trusted, consistent, and accurate data and reports for decision making at Georgia Tech. Sponsors of this initiative include Steve Swant, Executive Vice President for Administration and Finance, Sandi Bramblett, Assistant Vice President of Institutional Research and Planning & Enterprise Data Management, and Katie Crawford, Senior Director of Enterprise Data Management. LITE provides a new, simpler way of accessing data on campus. Additionally, LITE data and reports utilize Enterprise Data Management's (EDM) Enterprise Data Warehouse which provides accurate, reliable, and governed data. Data and reports are in a myriad of locations and come from systems across campus. Access to data central to decision making on campus can be difficult to obtain, and reports across systems can lack consistency due to differences in definitions and assumptions. Through LITE, data and reports are accessed from a single Enterprise Data Warehouse where accuracy and consistency is assured. 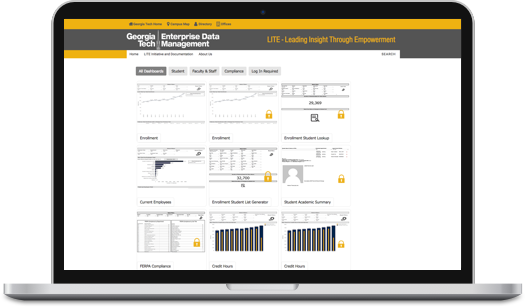 LITE allows for less time spent finding and accessing data, and more time spent analyzing and making key decisions about Georgia Tech.